Jubilee tomatoes are higher in vitamin C and less acidic than most other tomatoes. They are orange with sweet, meaty flesh and grow on indeterminate plants that can be short-stemmed and stiff. They were chosen as an All American Selection winner in 1943. Outstanding Features: Fruit is ready about mid-season. 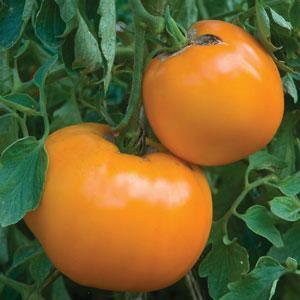 Click here to buy Jubilee Tomatoes direct from www.buygardenvegetables.com.